Lithium Iron phosphate batteries are safer than Lithium-ion cells, and are available in 5 to 100 AH packs with much longer life than any commercialy available battery. These li-ion cells and batteries not only have high capacity, but can deliver high power. High-power lithium iron phosphate batteries are now a reality. They can be used as storage cells or power sources. 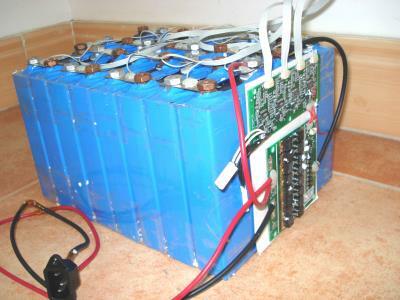 In addition, Lithium Iron Phosphate batteries are among the longest lived batteries ever developed. Test data in the laboratory show up to 2000 charge/discharge cycles. All of the following products are available by special orer. Chargers and battery management boards are available. We are now offering total turn-key solutions for almost any capacity and voltage made of the following building blocks. Delivery is typically 4 weeks. 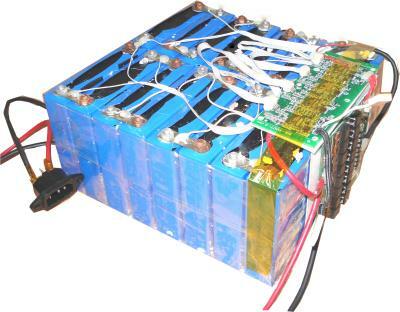 Other combinations of the battery management systems listed here and the cells listed on the power lithium battery cell page are also available upon request. This is a photo of a 10 amp hour 48 volt pack. This is a photo of a 20 amp hour 48 volt pack. State of the art lithium-iron-phosphate packs cell with laser welded stainless steel cases, no polymer, rubber, or plastic seals. Cycle life 1000 to 2000 cycles.